In the summer of 2007. 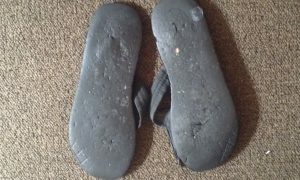 I picked up a pair of black Airwalk flip flops at Payless during the BOGO sale. I don’t remember how much I paid for them, but I can’t see myself paying more than $8.00 for them. (Although what they’d become to symbolize to me is priceless.) My 1st son was born that same year in March and I needed a sturdy sandal to help me navigate motherhood with a 4 year old and an infant during the summer months. During that summer I wore them everywhere I went. I wore them in the house while doing chores or just chilling; they were my go to shoe. When the weather started to turn cooler and it no longer made sense to wear flip flop outside, no matter how convenient, they became my exclusive house shoes; house shoes the shoes I only wear in the house because I don’t want to track the dirty from the streets on my floors, they only see outside when I’m making a quick run to the corner store or if I have to take the garbage out. They were especially my shower shoes, I don’t step on anybody’s bathroom floor, not even my own, so I always need a shower shoe between my bare feet and the floor, and they were perfect for the job. 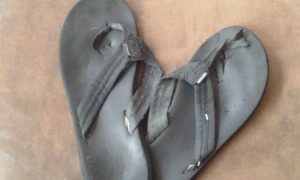 When we lost our home, they were the shoe that I made sure I packed. No matter where we lived, my Airwalk’s were right there offering a familiar comfort to my feet, even when my surrounding were neither familiar nor comfortable. A few times one or both of them would disappear, sometimes for weeks at a time. Then all of a sudden they would show up in a place I’m certain that I’d checked. I understood though, it’s a huge responsibility to be someone footprints. If one or both of them needed to break out for a little while for some time off, so be it. They’ll always show back up to continue on my journey. 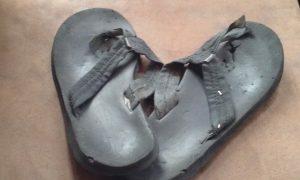 But atlas, a few days ago, after almost ten years, I put them on and walked about 20 steps and the throng part of the strap separated from the footbed, leaving a hole in them. My heart nearly broke. I just about cried looking down at them, with the right shoe’s strap flapping off to the side. 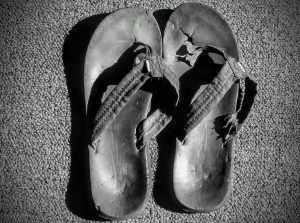 My voice quivered as I announce to my family that my flip flops had finally died. It was clear that they had seen better days and it t was only a matter of time before I could no longer wear them. It became apparent about two summers ago that they weren’t able to perform like they once did. But they held on for as long as they could. I haven’t been able to throw them away yet. The garbage seem so undignified for them. We have been through a lot together. They have been present for almost every major event of my life since 2007. They weren’t just sitting in the closet overhearing what was going on; they were experiencing what was going on right along with me. Losing them is like losing a part of my support system. I don’t have any shoes in my closet that can take their place as a go anywhere shoe AND a house shoe, which meant I will have to buy another pair of flip flops, probably just for a house shoe. Hopefully with any luck, they will have a long life like my black Airwalk and for them to be a comfort as a continue my journey to greatness. R.I.P. 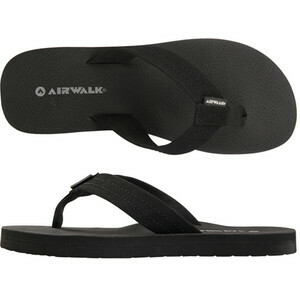 Black Airwalk Flip Flops. Thank you for being there for me. Do you own a pair of shoes, or another article of clothing that you’ve had for a long time that has been an ever-present part of you life?